As the only true option for permanent tooth replacement, dental implants are becoming more and more common for dental patients who suffer from tooth loss. Dental implants are quite different from other options of temporary tooth replacement like removable bridges and dentures. Dental implants are comparatively more expensive; however to patients of all ages the advantages of dental implants are priceless. When it comes to maintaining your oral health a dental implant can replace a single missing tooth or multiple missing teeth Dental implants do not have to affect or use the surrounding teeth for support. When you are able to leave healthy teeth alone, it is a step in the right direction for your oral health. Designed to last a lifetime, this is not your typical temporary solution for tooth replacement. Dental implants are very natural in appearance, and are designed to look and feel like a natural tooth. Implants are anchored into your jawbone creating / reproducing a tooth root which adds increased stability and durability. 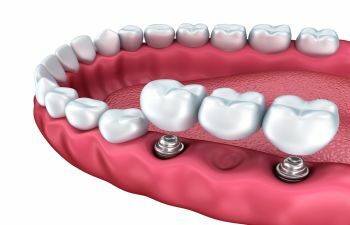 Dental implants create important stimulation to the jaw bone so there is no bone atrophy or bone loss which can happen when a tooth is not replaced (as with dentures or bridges). Unlike dentures and bridges that are removable and less comfortable, dental implants are permanently attached in your mouth helping to improve speech, making eating easier, creating a natural feeling and looking smile. In fact, most dental implants blend extremely well with the recipients natural teeth and become undetectable to the untrained eye. If confidence is king, most patients who receive dental implants feel more confident and secure with their smile. To many, this heightened level of self esteem is priceless. If you’ve suffered from tooth loss, you can now confidently greet the day with a healthy, secure, natural looking and comfortable smile. Dental implants are a permanent solution for many dental patients and offer a long list of advantages over temporary tooth replacement options. If you are dealing with tooth loss, ask your dental professional if dental implants are a viable option to permanently restore your smile.